Thank you Daisy Days for Learning and Sprinkles to Kindergarten for nominating me for the One Lovely Blog Award!! Please go look at these beautiful blogs! 2. 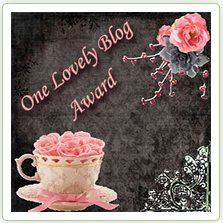 Pass the award to 15 other Lovely bloggers. These are the blogs that I nominate!!! finding one for beginning teachers). you may know is in their first year of teaching as well. It would be greatly appreciated. I don't have much to offer in terms of blogging/ teaching suggestions as of yet but I hope I'll get so much better in the future and that hopefully, this community of beginning teachers can help and support each other, as well as share ideas. HI Michelle! Thank you so much for the award! You are very kind! I am also your newest follower! WOW! You made my night! Thank you so much! Thank you so much for the blog award!!! I am so honoured! Thank you so much for the award! It really means a lot! Your blog is awesome! Michelle, Thank you! You are so kind! I love your blog! "Egg" citing! We can recycle with art! You know you teach when you....Linky Party!